PUTRAJAYA, Feb 13 — A civil society group formed to help locate the mysterious disappearance of Pastor Raymond Koh and several other individuals are at the Prime Minister’s Office (PMO) here today, desperately hoping that the new Pakatan Harapan administration could provide closure. It has been exactly two years since Koh disappeared without a trace on February 13, 2017, and Citizens Against Enforced Disappearances (CAGED) said they are counting on Tun Dr Mahathir Mohamad’s administration to shed light on the disturbing incidents. In a memorandum to the PMO, CAGED urged Putrajaya to give immediate attention to solve Koh’s disappearance, which the group believed was related to three other suspected abduction incidents involving religious social workers. 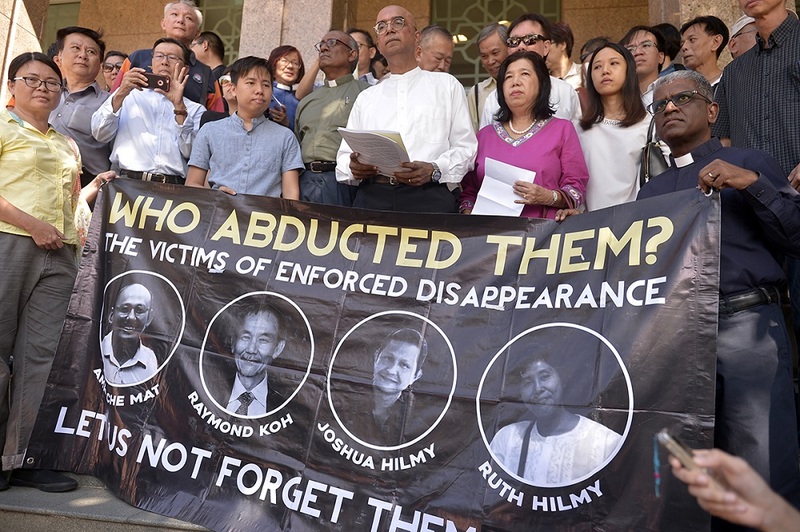 “We believe these disappearances are all related because all four were religious social workers and Pastor Raymond Koh and Amri Che Mat were persons of interest to the Special Branch of the police,” the group’s representative said. 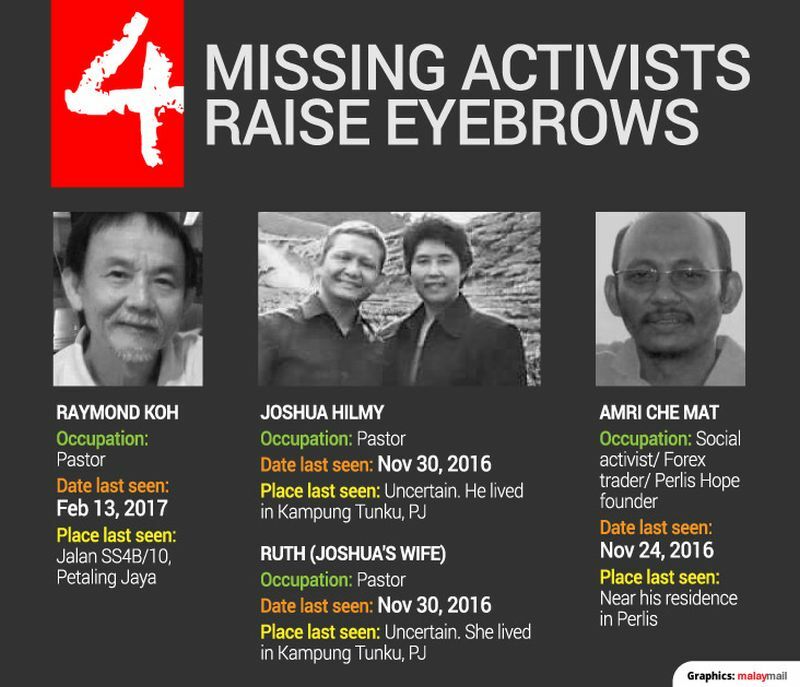 Amri, Joshua Hilmy and his wife Ruth Stepu, an Indonesian national, and Koh were said to have been abducted in the span of two and half months. The first three disappeared late 2016. Koh, 62, was abducted on February 13, 2017, in broad daylight by about 15 masked men in seven vehicles in what church groups and family members said seemed like a well-orchestrated “para-military” operation. Amri — a Muslim forex trader from Perlis who founded the social welfare organisation named Perlis Hope — was abducted near his home on November 24, 2016. CAGED alleged Amri, believed to be a Shiite, was also bundled up into a car by masked men. That same month, Pastor Joshua Hilmy and his wife Ruth Sitepu, also disappeared. Until now, the police have yet to solve the cases or provide any convincing explanation. CAGED’s spokesperson Dr Hermen Shastri alleged the police were unhelpful during the inquiry proceedings that the National Human Rights Commission (Suhakam) held to investigate the disappearances. Suhakam is expected to release the preliminary findings of its inquiry this year. CAGED said its only hope now is that the Pakatan Harapan administration would agree to form a fresh independent police team to lead the investigation. “When PH won GE14, Tun (Dr Mahathir Mohamad) announced that the new government would uphold the rule of law,” said Shastri, who led the delegation to submit the memorandum to representatives from the PMO.